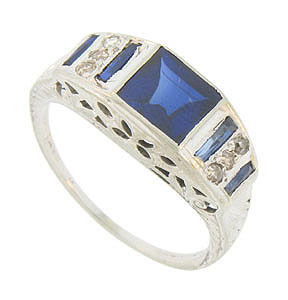 This antique 14K white gold ring is set with a square synthetic sapphire. 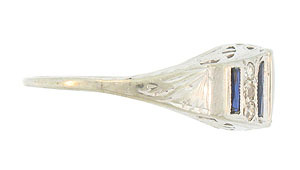 A pair of sapphire baguettes set into the rings shoulders are interuppted by a trio of fine faceted diamonds. 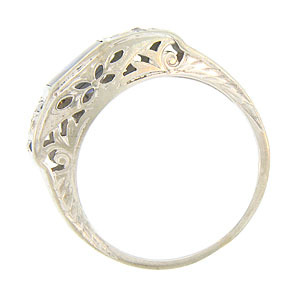 Floral filigree and delicate engraving adorn the rings sides. 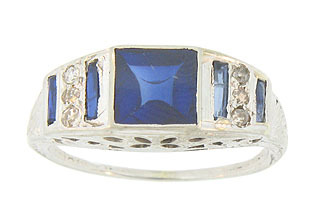 The Art Deco ring measures 7.55 mm in width. Circa: 1920. Size 5 1/2. We can re-size.